In Memory of Nikita "Niki"
It is only fitting that a my best friend gets a tribute due to all the love and devotion she has given us and all that she has accomplished over the years for me, my family and for our soldiers. After Snowy passed over the Rainbow Bridge all were heartbroken in our house. That’s when I received a call of a puppy in need of a home. Ever since that first day I was given the honor of having this small abandoned puppy become part of my family I knew she was a very special dog. For years she gave us all more love and affection than anyone could ask for. When years later her adopted sister, Mica, traveled over the Rainbow Bridge it was obvious Niki was grieving but she was there for her family and comforted us all without hesitation and helped us all get thru a very difficult time. But even before her need to help us morn Mica’s passing she and Mica had taken up the mission of assisting their 4 Legged Heroes. Mica was not feeling well so Niki and I went alone to the 2009 Memorial Day Parade in West Milford. 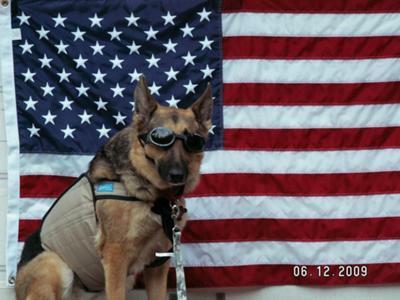 Niki was geared up as a Military Working Dog to honor her 4 Legged Soldiers. A soldier who had just returned from Iraq approached us. He thanked us for bringing awareness of the importance of the MWD’s and how they save thousands of lives. That’s when Support our 4 Legged Soldiers organization was born and Mika and Niki became its K9 symbols. Mica was not strong enough to go to events but Niki took on the job and for over two and a half years assisted in generating thousands of dollars for equipment for the MWD Teams and assisted in bringing awareness of the need and value of her 4 Legged Heroes. 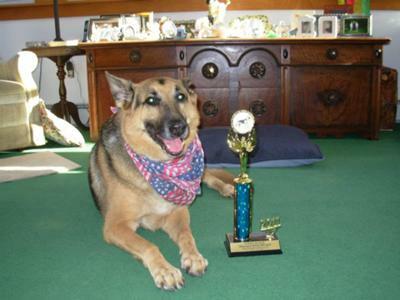 She had become known to so many and was called a Military Working Dog Ambassador or even West Milford’s USO K9. She was known to young and old alike and she proudly wore her harness and doggles when she greeted her supporters with a paw and licks. Even the most timid human couldn’t help but love and want to pet Niki. traveled over the Rainbow Bridge with her yesterday as I held her face in my hands and kissed her good by with one last kiss in the presence of the most caring staff at the Greenwood lakes Animal Hospital. I have been called a hero by many for helping our Military Working Dog Teams but Niki was truly the hero for it was she who caught the eye of that soldier in 2009. Good Lord thank you for allowing me the honor of taking care of Niki on this earth until you thought it was time to bring her back into your ever loving arms. I’m sure she’s running with Mica and Snowy forever happy and free of pain. I pray one day I may meet her again in Heaven above. For all that read this please in Niki’s memory remember and support our soldiers, especially our MWD’s, and thank them all for keeping us safe. I’m sure that would have been Niki’s last wish for her 4 Legged Heroes for truly, Where Angels Fear to Fly, K9 Leads the Way!” So I’m very sure all the Angels in Heaven are very safe with our Heroic K9’s that have gone before and they‘ve given Niki a well deserved welcome into their midst. Thank you, and farewell to my Best Friend, Niki you will be forever in my heart and mind! See a Soldier, Thank a Soldier. See a Soldiers Family, Thank them for their Sacrifice! Thanks so much for allowing us to share in your celebration of your wonderful girl Niki's life. And what a wonderful cause she helped you promote - I can't think of a more fitting way to promote the MWDs than by the wonderful efforts of people like you and all those wonderful animals like Niki. From the bottom of my heart I am so sorry for your loss but I do believe you will see her again one day, and all the other animals that were once in your life but have now crossed over. Your grief will help you remember her - cherish your memories. And thank you once again for sharing your wonderful story here with us all! Comments for In Memory of Nikita "Niki"
Your heartwarming story about Niki brought tears to my eyes. When you think of her, Smile, she was an Exceptional and Loving GSD. Thank God for soldiers and our soldier dogs. God Bless Niki, she is in Heaven with the Angels. Thank you for sharing your story of. Niko. May God Bless you for all that you have done. Thank you so much!